The densities and survival of many wild animals are presently at risk. Crucial for improving conservation actions is an understanding on a large scale of the relative importance of human and ecological factors in determining the distribution and densities of species. However, even for such charismatic species as the African elephant (Loxodonta africana), spatially explicit, large-scale analyses are lacking, although various local-scale studies are available. 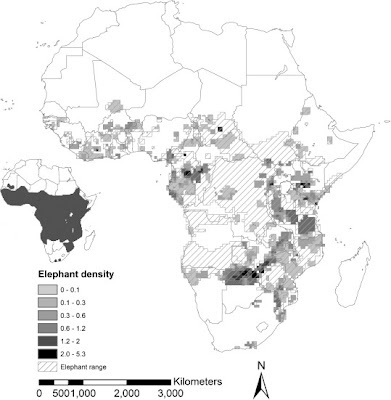 Here we show through continent-scale analysis that ecological factors, such as food availability, are correlated with the presence of elephants, but human factors are better pre- dictors of elephant population densities where elephants are present. These densities strongly correlate with conservation policy, literacy rate, corruption and economic welfare, and associate less with the availability of food or water for these animals. Our results suggest that conservation strategies should be organized in a socioeconomic context. The successful conservation of large animal species could depend more on good human education, greater literacy, good governance, and less corruption, than merely setting aside areas for conservation.